Our email subscribers are the first to hear about classes, workshops, summer programs and special events. Don't miss out! 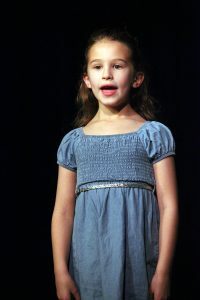 Since 2008, Broadway Workshop has been producing a FREE industry showcase in conjunction with The Random Farms Kids’ Theater (RFKT). Random Farms is an amazing organization based in Elmsford, NY (Westchester County). I worked at Random Farms for many years with Anya Wallach who created RFKT and who has done amazing things for youth theatre. Anya and I were seeing so many companies offering Industry Showcases where students were paying $400-$800 to participate. We felt that together we could produce a showcase where every student accepted would not have to pay a fee to perform in front of agents or managers and we could really help jump start so many careers. Typically, we have around 300 students audition each year and we create a cast of 40-50 students to perform on the big night in NYC. Anya and I rent an off Broadway theatre venue to present the showcase and we are able to bring together around 30 top industry professionals to attend every year. Rachel Resheff – appeared in our first showcase! So you might be asking “What is the catch?” There legitimately isn’t one. It’s such a win/win for us. Yes, its a ton of work to put the event together, setting up auditions, scheduling industry guests etc., but we get the amazing pleasure of working with students we have never met and giving a really amazing opportunity to kids we are currently working with. It’s also really incredible to help educate parents about the industry and what to expect. It’s my favorite thing to see a kid from our showcase go on to a Broadway show. It’s been such a rewarding process for us! in our showcase include: Katherine Reis (Unbreakable Kimmy Schmidt, Bull, All We Had), Rachel Resheff (Shrek, Billy Elliot, Mary Poppins, Fish in the Dark), Gianna Harris (School of Rock), Zachary Unger (Billions, Containment, Bway – Chaplin, Newsies), Alessandra Baldacchino (Fun Home) and the list goes on and on. Our 2016 Showcase dates have just been announced and audition sign ups will begin the first week of November. Click here for more info! We hope you will come out and audition either in NYC or in Elmsford at Random Farms’ Studio! Broadway Workshop, LLC. Marc Tumminelli, Director. 445 W. 54th Street #5A. New York, NY 10019. ©2014. All Rights Reserved. Another site by James Did It!